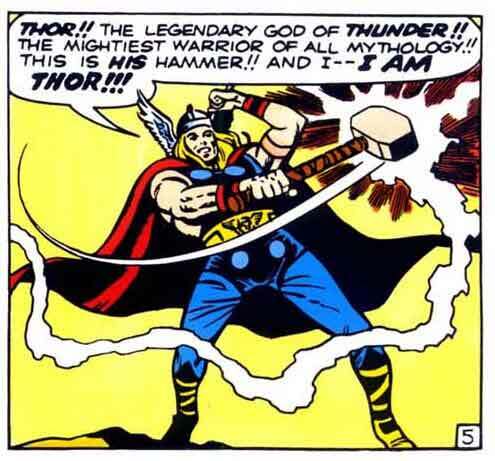 In Journey Into Mystery #83, in August 1962, Stan Lee, Larry Lieber, and Jack Kirby unleashed the Marvel version of Thor, the Norse God of Thunder, around the world. The original concept was a bit different from what the movies show: Thor is sent to Earth by Odin to learn humility ... as a crippled doctor named Don Blake! One day, Blake finds a walking stick, stamps it on the ground, and becomes Thor (again — don't ask. It's pretty confusing, kinda). From #83 to #100, various creators tried their hand on the character. 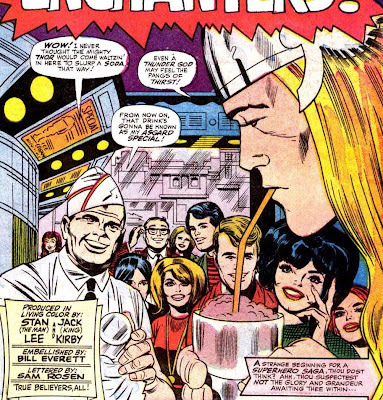 Lee and Kirby then reunited and went on a 79-issue run (with some annuals), from #101-#179 (It was retitled to Thor from issue #126), and, well, it was a rise. 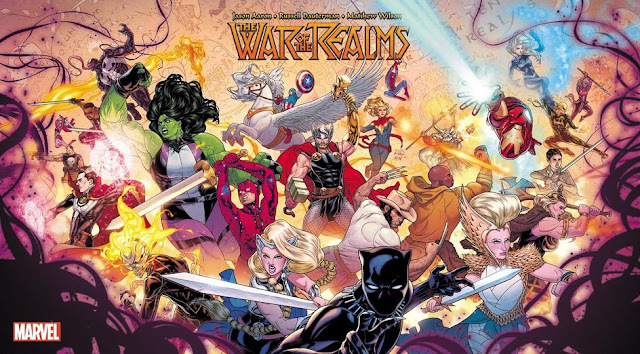 In Marvel: Five Fabulous Decades of the World's Greatest Comics, comics historian Les Daniels noted that it went from being a superhero comic into a "spectacular saga." Let's take a look at some things I observed while going through Stan and Jack's Thor. It's been said that Thor was Marvel's answer to Superman, in terms of power level, and I think it'd be hard to argue against it. He's really powerful, wears a red cape, and commands the attention of the room. 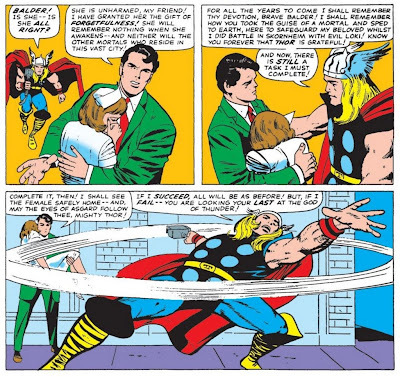 But also, much like Superman at the time, Thor had a knack for pulling random powers out of his red cape. He could create portals, he had superbreath, and — my favorite — he had superventriloquism. 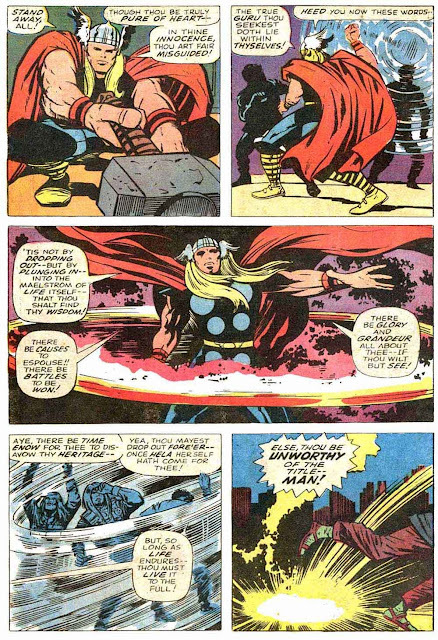 Much like Superman at the time as well, Thor's powers were also really inconsistent in these as well. Sometimes Thor's hammer would return to him (as dictated by the enchantment), sometimes it wouldn't (so they could invoke the "If I don't get Mjolnir back in 60 seconds, I'll turn into Don Blake!" weakness). Jack Kirby is responsible for how fights are depicted in superhero comics (and to some extent, comics of other genres) today. This is especially true of fistfights. I thought it when I was reading his New Gods, and I thought it while reading Thor. There's a rhythm to his fights and a pacing that is hard to match. 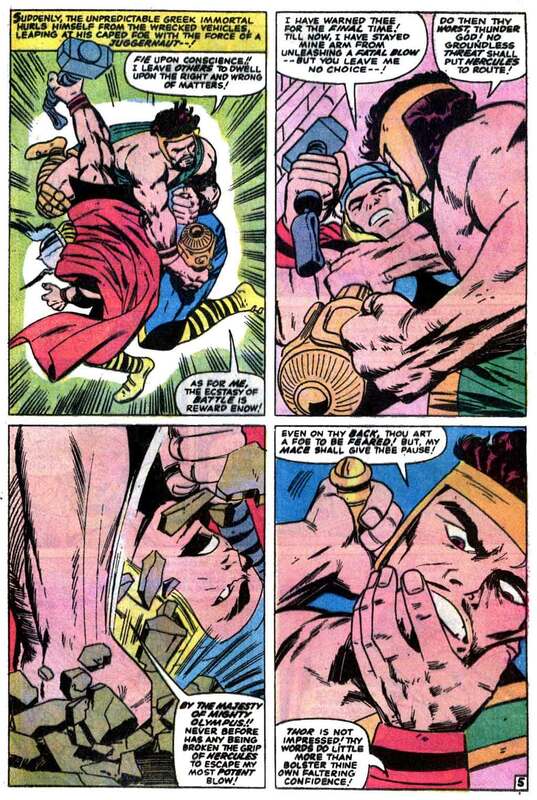 Here's Thor fighting Hercules. Just to put that in perspective, let's look at how DC was doing fight scenes back then. Okay, so I've created a bit of a straw man there for my argument, but hopefully that's enough for a comparison. Kirby was okay with zooming in and going in for really tight shots to amp up the intensity, and okay with not showing you most of the figure, trusting you to be able to give closure to the images. 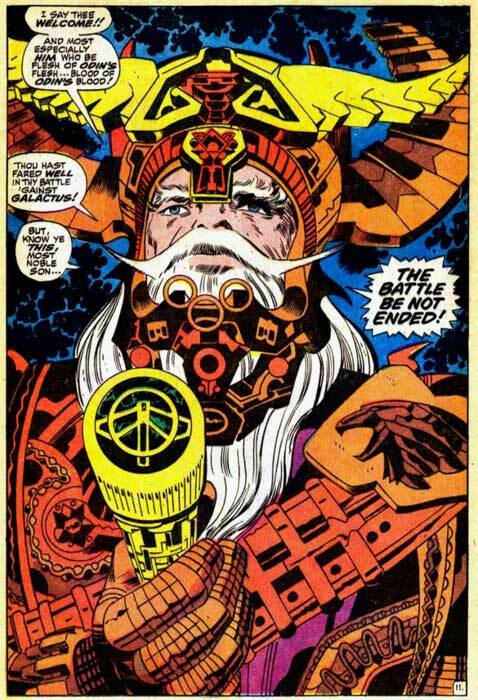 You don't realize this now, because, as Neil Gaiman said a few months ago, Jack Kirby's influence was so big. Like Tezuka in Japan, or Bill Russell in basketball, everyone who followed Kirby was in some way or another influenced by Kirby. That today's fight scenes are so dramatic is a testament to the reach of the King. One thing I certainly thought of while reading this is that contingent of fans who seem to hate the Marvel movies and call them "insubstantial" and "too blockbuster." Superhero fans decrying action just doesn't make sense to me, because action is a huge part of what Jack Kirby did, and he's almost inarguably the most important and definitive superhero artist of all time. It didn't make the work dumber or less substantial. As human beings, we have five senses, we have a head and we have a heart. Kirby's work engages all of those. I think anyone choosing to focus just on any one of them to the ignorance of the others is doing themselves a disservice. 3. 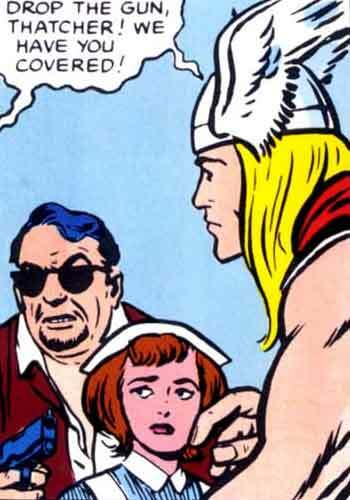 I don't know why people get on Stan Lee so much; Thor's dialogue is awesome. People like to rag on Thor, especially early Thor, because of the archaic dialogue. But if they ever actually read the words Stan put into Thor's mouth, I think they'd have changed their tune. It was so over the top, and awesome. 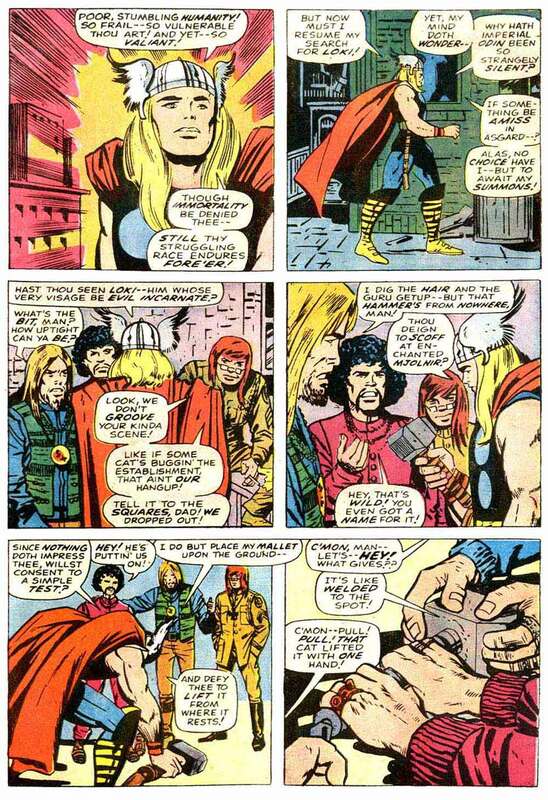 My favorite example is that time Thor decided to lecture some hippies. Stan may have been prone to hyperbole and to dialogue that absolutely no one ever would have said, but in Thor, these were advantages. Like Amazing Spider-Man and Dr. Strange to some extent, Thor starts off a little slow, but eventually just hits a point where the action just doesn't stop. It's just one adventure after another. 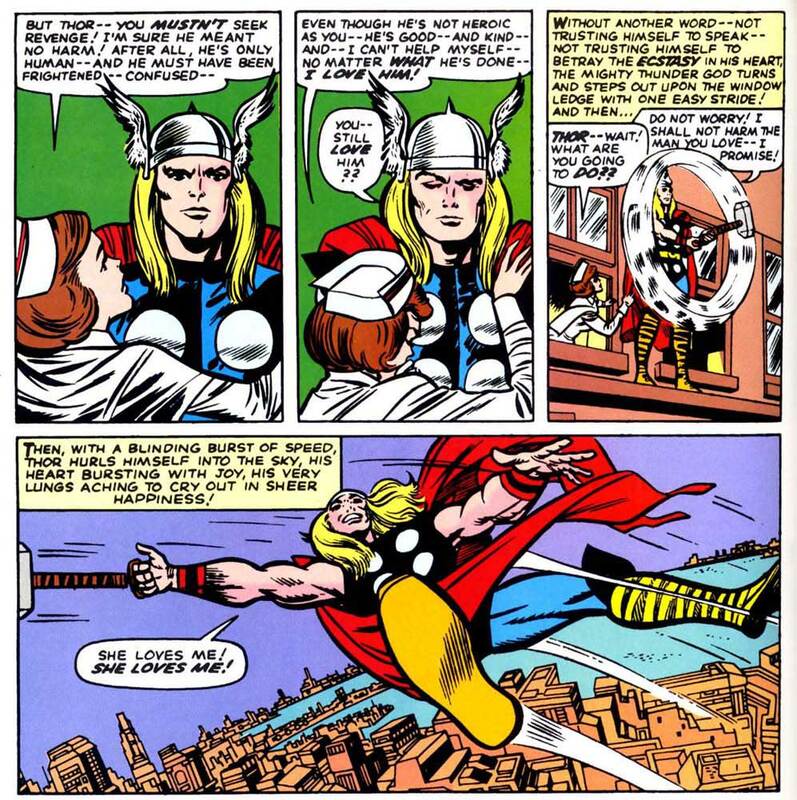 Thor is in love with Jane Foster, but Odin won't let them get married because an immortal can't marry a mortal. So Thor goes to plead his case, at which point Hercules shows up on Earth, and a dejected Jane flirts with him to make Thor jealous. 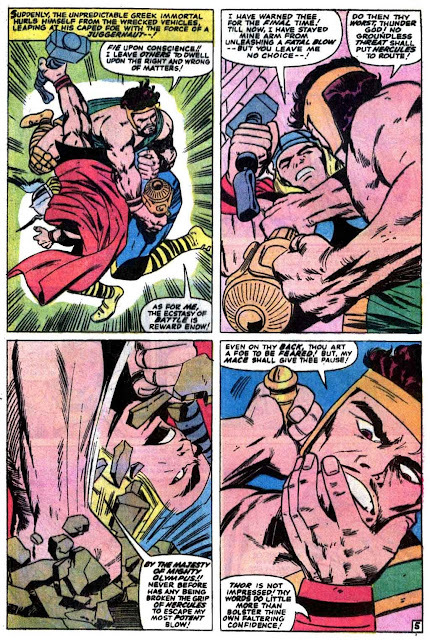 Thor then comes back and he and Hercules have a fight, because that's what you do when someone hits on your girl, and then Odin cuts Thor's power in half, but this enables Siedring the Merciless to take over Asgard, and — well, yeah. It's one thing after another. And for Thor, it just works. The God of Thunder should be going from one adventure to the next. For those who may be fatigued by today's "gotta fit in a paperback"–structured stories, the pace of this might be refreshing. With today's computer-enhanced artwork, creating things like clouds, stars, astronomical bodies, and whatnot become more of a combined effort between the artistic collaborators (pencillers, inkers, colorists, computer separators), and effects can be added in postproduction. It was still that way back in the 60s, but I find that like the Silver Surfer's shine, I miss when things were delineated and the colors were a little flatter. I actually think it looks more dynamic and more fun to look at. 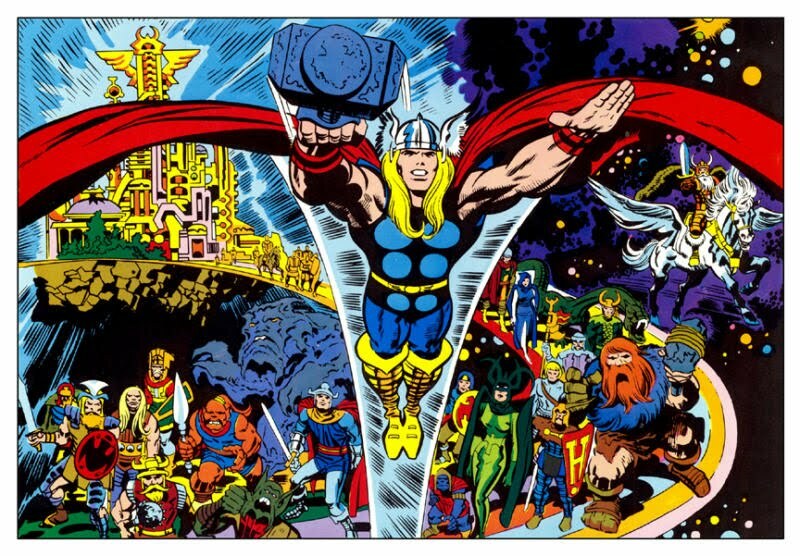 Kirby and crew in particular had a way of putting the space elements together to emphasize scope (it seems like a lot of things were exploding), and combined with Asgard, it looked awesome. And Kirby dots! There have been many ways to depict energy and immaterial stuff over the years, especially with computers, but nothing will ever beat Kirby dots to me. For a long time, the Thor comics had a main feature and a "Tales of Asgard" backup feature, which told the story of the universe from the Asgardians' perspective, in essence retelling stories from Norse myth into what was then the modern Marvel cosmology. (I quite like the fact that if it's a Thor story, the universe was created because of Norse stuff, and if, say, Reed is talking, it's because of the Big Bang, which also relates to Galactus, and this can coexist in the same universe somehow. "Tales of Asgard" was a useful tool because it gave us looks into Thor and his friends well before the main present-day storyline. From the creation of the universe to the first time Thor lifted Mjolnir, from the origin of Balder to the adoption of Loki, to a whole new adventure of their own when they were all older, "Tales of Asgard" gave a sense of history that you wouldn't really get with someone who's not an immortal, or at least someone very long-lived. I know Alan Moore tried it with Tom Strong in Tom Strong's Terrific Tales, but I think that it can be more widely used than it is. It was popular enough, at least, to get a whole collection. This just hit me while reading it. One of the more common complaints about modern comics and today's current superhero movies is that the costumes are overthought and that costumes are just a superhero convention. True as that may be, more often than not, superheroes did have reasons for wearing what they wore. Superman wore it to resemble a circus strongman, Batman wore it to strike fear into the hearts of criminals. 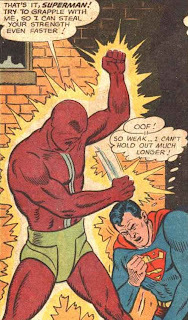 After that, okay, the spandex thing got into "convention" territory, but by the Silver Age, it was in play again. Green Lantern was a space cop, and that was their uniform; Flash wanted to honor his hero. It's full force in Silver Age Marvel. Spider-Man wears vibrant colors because he wanted to be an entertainer. Iron Man's first armor is clunky (he made it in a hurry) and then he refined it. Hulk just wears torn purple pants. And Thor? Well, those are just Asgardian clothes. Actually, in a way, I kind of feel like Asgard is some kind of mythological version of Riverdale. The gods chill, they hang out, Volstagg is funny, they drink a little bit, laugh at the fact that Loki was bad and got sent to his room by dad, go on dates, Balder and Karnilla flirt, Amora and Skurge go after Jane Foster and then get yelled at. It's all fun. Except of course, Loki is much deadlier than Reggie Mantle. So it's all serious, too! As the series progressed, Kirby more and more went to the splash page. This was to illustrate the grandeur of Thor's world. 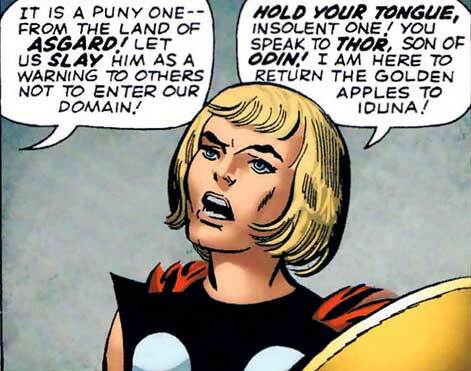 Often, he'd even just do it to introduce someone like Odin. But these are Asgardian gods, and they're done by Stan Lee and Jack Kirby, so even the most mundane things have scope and grandeur. Ben has covered a bunch of them here, so I'll just show you my favorite. 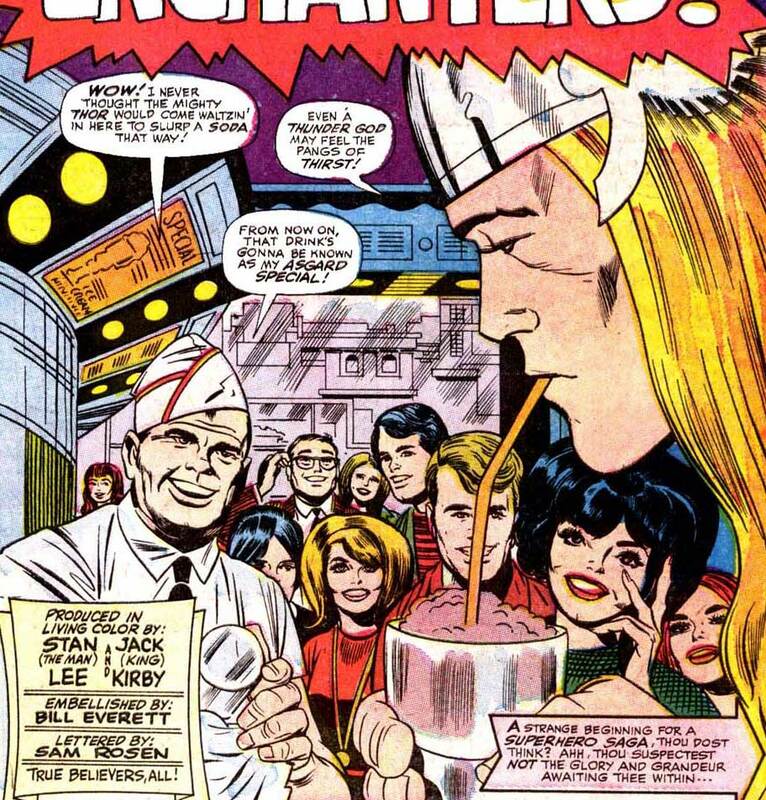 Witness the Mighty Thor, partaking of a milkshake! Or a soda. I dunno, the words say one thing and the pictures show another. Over here, Thor looks like he's falling, but I love it. He's all arms akimbo and just has to take up the whole panel! Because he just has to, dammit! "Relatable" is a buzzword given to almost every piece of fiction, but I've always found it used to mean that the character is just like us in the worst possible ways: they're morally ambiguous, they pick fights with their friends, they have petty troubles. But for a god, Thor is all too human. In many ways, he is relatable. He loves his dad too much to drastically disobey him, but he can't stand some of his dad's decisions. He loves his brother, even if his brother is a troublesome menace. But Thor's relatability isn't limited to the worst traits we as humans have. They also reflect the best of us. When Thor finds out that Jane Foster is, in fact, in love with his human identity of Don Blake, here's how he reacts. In many ways that matter, Thor is just like us. Even the best ways. And maybe by emulating his courage, his nobility, his diplomacy, and his heart, we too can be just like him. Or, you know, we could die in glorious battle by doing something stupidly. It is a fictional character who goes around bashing people with a hammer.